ISLAMABAD: Prime Minister Nawaz Sharif on Monday said planning for energy is our economic vision and no delay or negligence will be tolerated in timely completion of energy projects. “The erstwhile governments did not pay any focus on energy problem. Energy planning is our economic vision. Completion of energy projects will ensure an end to load-shedding and increase in power production”, he said while chairing a meeting in Islamabad to review progress on various energy related projects. “I am monitoring power projects. Timely completion of these projects will be ensured. 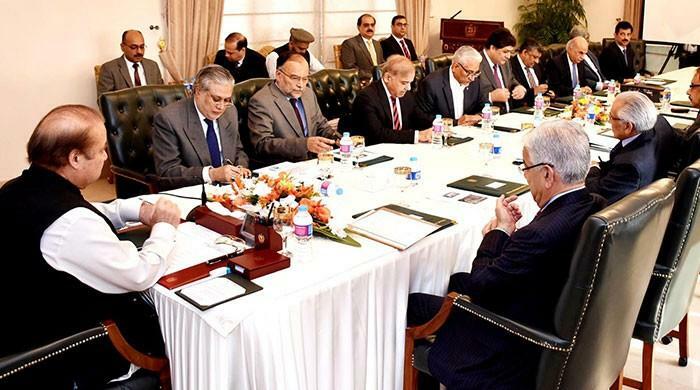 Any negligence or delay will not be tolerated at any cost”, PM Nawaz added. The Prime Minister said the government is not only striving to overcome load shedding but also making efforts to provide affluent electricity to people. He said the long-term plans of the government include a production of more than 30, 000 MWs of electricity by 2022. Nawaz Sharif said that increased power generation would substantially contribute towards economic growth and increased industrial activities. He said he is personally monitoring the progress on the ongoing power projects across the country to ensure timely completion of these projects. The meeting was given a detailed briefing on the capacity and timeline for completion of various ongoing power projects in Pakistan. The meeting was informed that around 10, 996 MW of power will be added to the national grid by March 2018 against an expected generation shortfall of 7, 000 to 8, 000 MW estimated for 2017-18. The meeting was also briefed that work on improving the transmission system is going on in all parts of the country. The Prime Minister said that getting rid of power shortages is essential for realising the huge economic potential of the country which was unfortunately ignored by the successive governments in last 15 years. The Prime Minister said the tireless efforts of the present government are not only restricted to end power shortages from the country by 2018 as the long term plans of the government include production of more than 30, 000 MWs of electricity by 2022. “Never in the history of Pakistan have there been such huge investments made for production of electricity aiming to fulfill our needs and also cater for the projected demands in the future”, he added. The meeting was attended by Federal Minister for Finance Ishaq Dar, Minister for Planning, Development & Reform Ahsan Iqbal, Minister for Water & Power Khawaja Muhammad Asif and Chief Minister Punjab Muhammad Shahbaz Sharif and others.